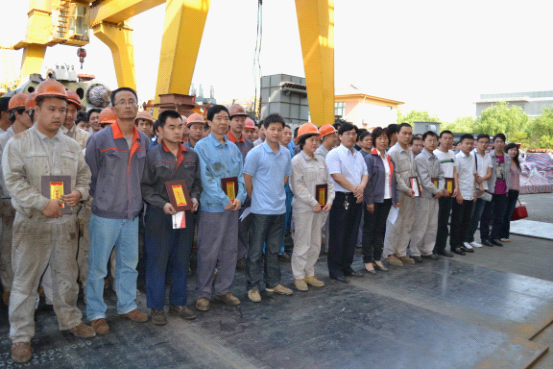 The May 23 2011, Shanghai Shibang Machinery ZhuQiao industrial park April "quality star" commendation ceremony was held in front of the office building. The congress read the results. Eight employees got April "quality star" honorary title. It is reported that "quality star selection campaign started from last year. At the beginning of every month, workshop director and department director recommend the department “Quality Star” candidate according to employee performance’s of each month, each workshop, each department. Then operation center and qc examine the candidates according to a series of appraisal standards like their task completion rate, month attendance, FPY and quality consciousness and so on. Eventually within10 selected employees shall be promulgated. ZhuQiao industrial park officials said: "quality is the life of enterprise. We hope to provide a discussion and unthinking platform through that way for group staff, letting us to attentively understand the important significance that quality plays for an enterprise. Making the first-class quality, first-class products, wining customer’s trust with high-quality, can we truly achieve the enterprise development and employee value in win-win situation." News / Privacy / © 2010 UNISBM All Rights Reserved.